A Recap on Some of our Recent Projects! 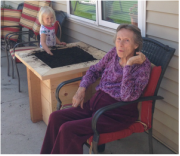 This year, Sage Gardeners was able to: provide raised, accessible, vegetable garden beds to the Belgrade Senior Center, twelve private residences in Bozeman, Belgrade, and Three Forks and we focused a majority of our time on our Maintenance Project. This is an annual project that assists in maintaining and supporting past year’s gardens to the need of that recipient; this project is annually increasing in demand. Through this project we deliver hands-on “how to” gardening classes, seasonal garden tasting presentations, seed and planting days, weed and harvest days, and “putting the garden to bed” days. We coordinated volunteers to help with check-ins and personal contact with residents. It was a busy year, indeed. 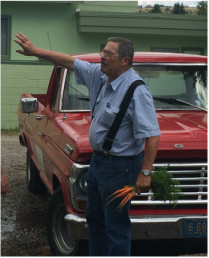 Lots of harvesting meant delivery of veggies to lots of seniors and the food bank; and we created tasty dishes to share with our harvests. Basil pesto, roasted beets with goat cheese, and a strawberry/rhubarb galette were among the favorites. Of course, we would have liked to have helped more as there is always a waiting list, but funding always limits how many gardens and seniors we can reach out to each year. We are hoping to expand our services next year to include a greenhouse/kitchen/gathering/educational space for all of our extracurricular activities like mini presentations, cooking classes, and canning. Sage Gardeners had a lot of media exposure this season. DIYPete.com is a local company (with over 35k subscribers) that focuses on building your own projects. They loved what we were doing and wanted to be able share our successes and raised garden bed plans nationally. We were filmed with some of our senior participants and projects - it turned out to be a delightful little media piece for Sage Gardeners. We were able to have a week of exposure in the window at First Security Bank in downtown Bozeman the second week of August, and we had two great articles written up on Sage Gardeners in the Bozeman Daily Chronicle. I would say, a season to be proud of, indeed! And, despite limited funding for a small organization, we are very proud of our work and our yearly accomplishments! The Belgrade Senior Center located adjacent to the Bozeman Yellowstone International Airport is a community facility that is committed to fostering an active environment for seniors. They offer many active classes, engage in several annual fundraisers, and serve healthy and fresh meals (using lots of fresh veggies from their new gardens!) to local community members. This past season Sage Gardeners, along with the help from volunteers, installed raised accessible gardens in the back on the senior center. We spent the day filling garden beds, pots, and planters to later be filled with organic tomatoes, greens, peppers, and some beautiful flowers that Carl tended to so carefully. As with all of our projects we will maintain these gardens annually to the needs and desires of the senior center. Even into October, we were still going strong and building beds! 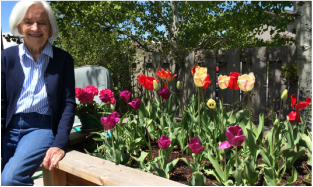 As most of our gardens were getting ‘put to bed’, we had one last project underway at the Cancer Support Community (Fall 2014). This specific project for Sage Gardeners, Cancer Support Community Project, involved building several large raised redwood vegetable garden beds at the Cancer Support Community’s new therapy garden, Garden of Hope, located at their facility in Bozeman. In collaboration with many businesses and volunteers, our goal was to complete our portion of the gardens by the end of October 2014. The design portion of the gardens was first completed (six large (different sizes) raised redwood beds), and then we built, delivered, installed, and filled with the assistance of many community volunteers. We had two separate planting days - it was a joy to say the least! The Cancer Support Community served roughly 640 individuals from across Montana in 2014. Statistically, 60% of all cancers in the United States occur in people age 65 and older. We could only be so grateful knowing that we helped one family or even one individual improve their quality of life because they were able to get their hands dirty and garden; or maybe they learned healthier eating habits from taking a cooking class that encourages adopting an organic-friendly lifestyle (one of the many classes offered at the CSC that will utilize our gardens). We built over 13 new raised redwood garden beds this summer (2016) for seniors living in their own home and wanting to continue gardening in their backyard.